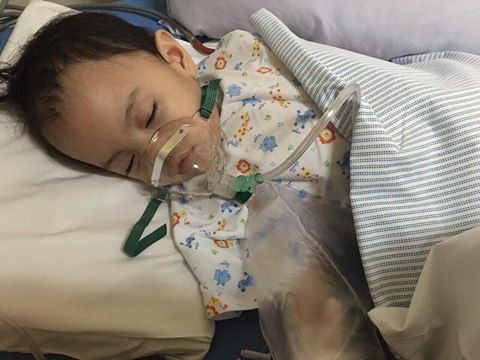 MANILA, Philippines - The family of a 17-month-old toddler suffering from a life threatening bleeding disease is knocking on our hearts for financial help to address her condition. Maya Fatima Ysobel Malimas or Maya was prematurely born at 37 weeks and had to endure 37 days at the NICU due to numerous infections. By God’s grace, Maya was able to overcome these and eventually go home. Just like other typically developing babies, Maya was steadily catching up with development milestones. However, when she turned 7 months old, Maya began having bleeding episodes. Without any warning signs like fever, rashes, loss of appetite or lethargy, Maya would vomit and excrete fresh blood. After several blood tests and ultrasounds, Maya’s condition was initially attributed on allergic reaction on cow’s milk. However, another bleeding episode happened two months later even after going on a strict hypoallergenic diet. When she was one year and two months old, Maya experienced massive bleeding that she had to undergo blood transfusions. Maya was finally diagnosed with multiple esophageal and gastric varicose after undergoing esophagogastroduodenoscopy. This condition was caused by her umbilical catheterisation when she was at the ICU. Such condition is a known risk of the procedure which Maya’s family only learned recently. Now at her most critical bleeding episode, Maya is currently confined at a hospital for blood transfusions. “This July, right now, Maya is suffering from her greatest, most critical bleeding episode so far. We've used three blood bags for transfusion. After a week in the hospital, we were sent home because the bleeding had stopped, only to be back at the hospital one day later because she's bleeding again. In one week, we've used up her entire medical insurance limit, and she is still not better,” Maya’s mother Mary Abigail Austriaco Malimas wrote at her Facebook page. With growing medical bills and expensive medical procedures awaiting, Maya’s family is humbly asking for financial support or leads to grants that can address Maya’s condition. For those willing to help fund Maya’s medical treatments, kindly check out the details on Maya’s Miracle’s Facebook page. You may also donate through their GoFundMe account.